Ion-exchange chromatography (or ion chromatography) is a process that allows the separation of ions and polar molecules based on their charge. It can be used for almost any kind of charged molecule including large proteins, small nucleotides and amino acids. The solution to be injected is usually called a sample, and the individually separated components are called analytes. 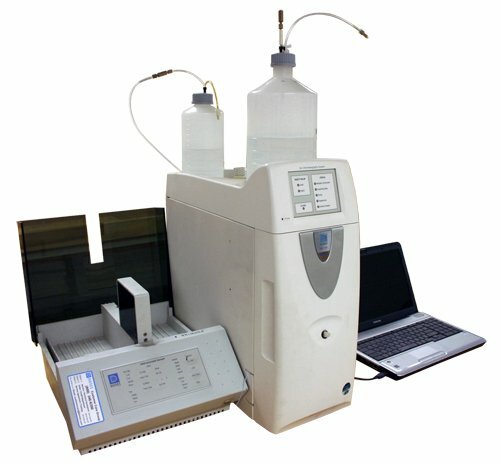 It is often used in protein purification, water analysis, and quality control. A sample is introduced, either manually or with an autosampler, into a sample loop of known volume. A buffered aqueous solution known as the mobile phase carries the sample from the loop onto a column that contains some form of stationary phase material. This is typically a resin or gel matrix consisting of agarose or cellulose beads with covalently bonded charged functional groups. The target analytes (anions or cations) are retained on the stationary phase but can be eluted by increasing the concentration of a similarly charged species that will displace the analyte ions from the stationary phase. For example, in cation exchange chromatography, the positively charged analyte could be displaced by the addition of positively charged sodium ions. The analytes of interest must then be detected by some means, typically by conductivity or UV/Visible light absorbance. If you would like to find out more about Ion-Exchange Chromatography or other technologies and services provided by American Assay Labs, please contact us and we’ll be glad to assist you with your goals.